This photo slide came from a box labeled "JFK Funeral 1963." There were several other photos in this group. The funeral of John F. Kennedy was on November 25th, 1963. The details of the horse drawn caisson match what you can easily find with a quick google image search. This appears to be after JFK's casket was removed. You can see some previously published photos of JFK's Funeral from Time Magazine. I love finding amateur snapshots of historical events like this. Here are some other photos from that same set. My guess is the the photographer was taking this photo with the body of JFK coming to Arlington. 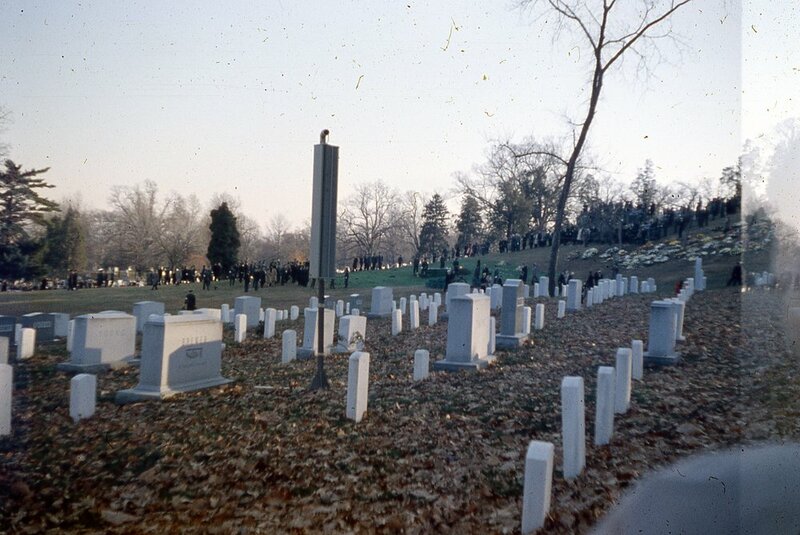 If you zoom on on this one you can see JFK's flag draped casket before it is removed. What important events in history do you have amateur photographs of? What do you remember about JFK's death and funeral? How did tragic events like this shape the way your family thinks and feels about history? What are the psychological impacts on a nation of such an event?